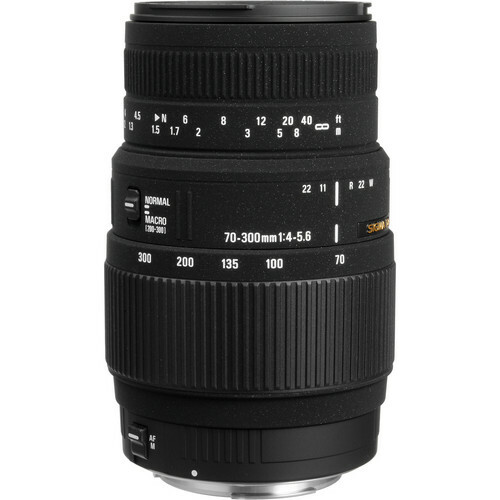 The Sigma 70-300mm 4-5.6 DG Lens is the ideal compact and economical choice for a telephoto zoom lens. By incorporating an autofocusing motor into the lens itself, it can now autofocus with all Nikon DSLR cameras (including the D40, D40x, etc.). In addition, with the motor built into the lens, focusing will be quieter and more responsive. Capable of macro photography, this lens has a 1:4 maximum magnification at focal lengths shorter than 200mm, from 1:2.9 to 1:2 at focal lengths between 200mm and 300mm, and 1:2 maximum close-up magnification at the 300mm focal length. 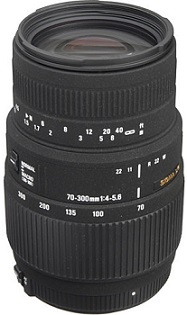 It is the ideal high performance lens for portraits, sports photography, nature photography, and other types of photography that frequently use the telephoto range. The DG lens design corrects for various aberrations. This lens is specially coated to get the best color balance while also cutting down on ghosting caused by reflections from the digital image sensor. Macro photography with a 1:2 maximum close-up magnification at the 300mm focal length Switch for changeover to macro photography at focal lengths between 200mm and 300mm with a maximum close-up magnification from 1:2.9 to 1:2 SLD (Special Low Dispersion) glass element in this lens for excellent correction of chromatic aberration Â The Sigma 70-300mm 4-5.6 DG Lens is the ideal compact and economical choice for a telephoto zoom lens. By incorporating an autofocusing motor into the lens itself, it can now autofocus with all Nikon DSLR cameras (including the D40, D40x, etc.). In addition, with the motor built into the lens, focusing will be quieter and more responsive. Capable of macro photography, this lens has a 1:4 maximum magnification at focal lengths shorter than 200mm, from 1:2.9 to 1:2 at focal lengths between 200mm and 300mm, and 1:2 maximum close-up magnification at the 300mm focal length.